My kids do not have any food allergies, which is something that I am eternally thankful for. However, it seems that Celiac Disease is really taking families by storm. As many as 30,000 Canadians could have the disease. Aside from the terrible symptoms and pain that accompany Celiac Disease, it is often very expensive to purchase a special gluten-free diet. 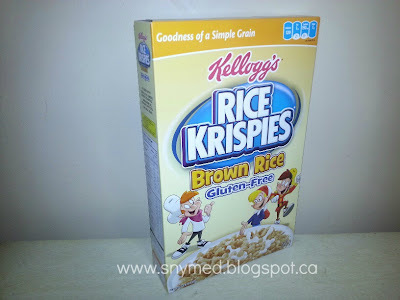 When I learned that Kellogg's Rice Krispies had offered a Brown Rice variety that is gluten-free, I was thrilled! Kellogg's Rice Krispies Brown Rice cereal is made from whole grain brown rice, it's a source of 10 essential nurients, contains no artificial flavours or colours, and is trans fat free. One cup of the cereal (without milk) is only 120 calories, or 180 calories (with 1/2 cup 1% milk). It is an excellent source of iron, thiamine, magnesium and manganese. Of interest, the cereal has only 4 ingredients, so it's fairly simple. Want Gluten-Free Rice Krispies? Look for This Box! 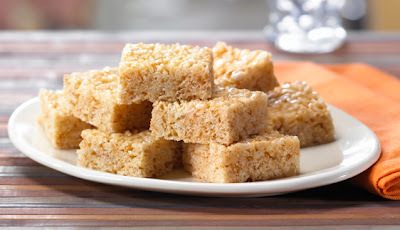 Looking for gluten-free recipes made from Kellogg's Rice Krispies Brown Rice cereal? Kellogg's Canada has a selection of such gluten-free recipes on their website. Check out their gluten-free apple crisp recipe, gluten-free brownies recipe, or gluten-free parmesan chicken recipe! Here is the Kellogg's Rice Krispies Gluten-Free Squares Recipe, as is printed on the inside of the box. *Note: as product formulations vary from one brand to the next, be sure to ALWAYS check the ingredients list to be certain that the brands you selected are gluten-free! To be gluten-free, this recipe must be made with Kellogg's Rice Krispies Brown Rice gluten-free cereal, gluten-free marshmallows, and gluten-free margarine. 1. In large saucepan melt gluten-free margarine over low heat. Add gluten-free marshmallows and stir until completely melted. Remove from heat. 2. Add Kellogg's Rice Krispies Brown Rice Gluten-Free cereal. Stir until well-coated. 3. Using buttered spatula or wax paper evenly press mixture into 13 x 9 x 2-inch pan coated with gluten-free margarine. Cool. Cut into 2-inch squares. Have you tried Rice Krispies Brown Rice Gluten-Free Cereal? Do you have any family members or friends living with Celiac Disease? 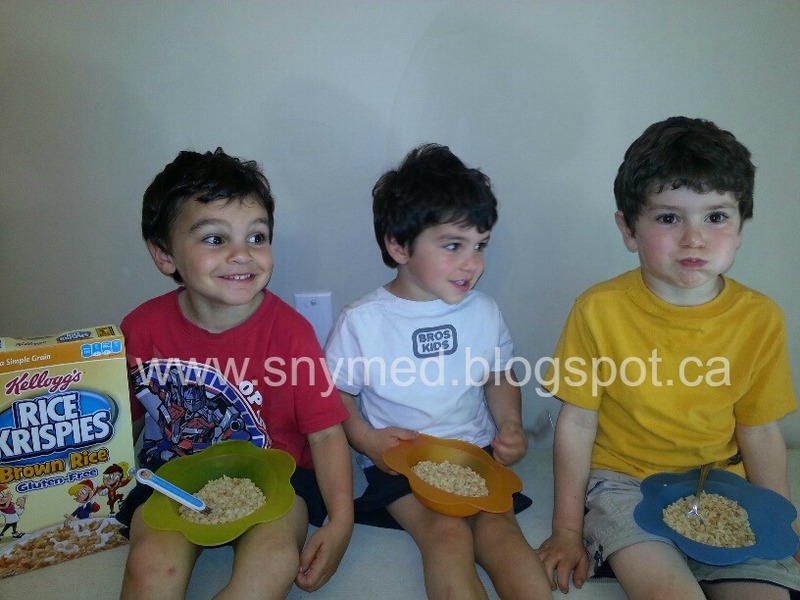 We LOVE Rice Krispies Brown Rice cereal. We aren't gluten free around here, but I do have allergies to other things and the regular rice krispies are coated in a bunch of stuff I can't have. I love that we can still have the "Krispies" with breakfast! And that these ones don't seam to get soggy as fast. I'm looking forward to trying these! While we're not required to be gluten-free we certainly are trying to cut back as much as we can. I am allergic to wheat so I'm one of the people who are so thankful that companies are beginning to recognize the need for gluten-free foods. And recipes :) Thanks for posting this one, I'll have to try it!! Thanks for sharing this! Having Celiac disease, I'm always on the look out for new Gluten free products! I appreciate your highlighted line about making sure every time you try a product you makes sure all ingredients are gluten free! VERY IMPORTANT but not known by many! I have tried these and they are quite delicious. If I ever want to go gluten free this cereal would be at the top of my list. I'm really looking forward to trying these!